Last time we were at Manchester’s Deaf Institute the tone was slightly different; the floor was well and truly shaking to the heavier sounds of Young Guns and POLAR [check that out HERE]. This evening it was refreshing to return to the quirky venue, with its eclectic wallpaper and shabby chic bohemian vibe, to see Spector. 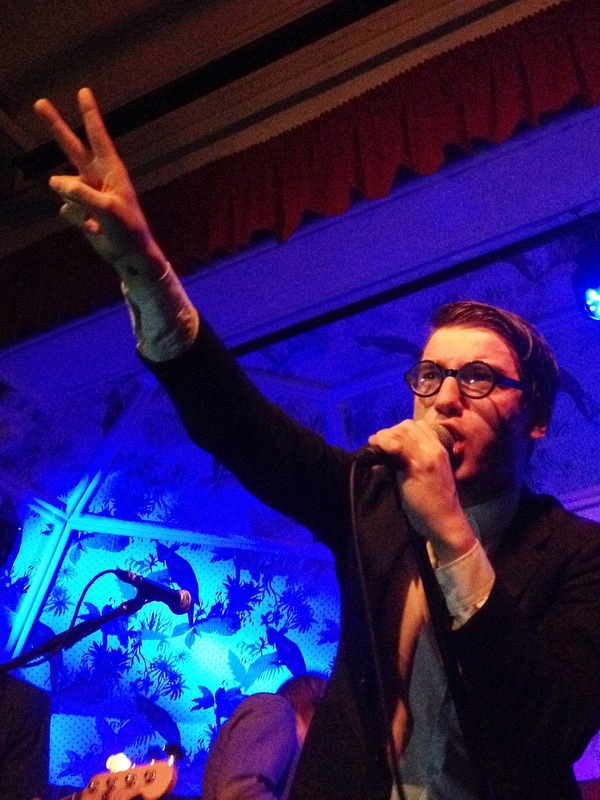 Spector are your new favourite band if the hype around them is to be believed. 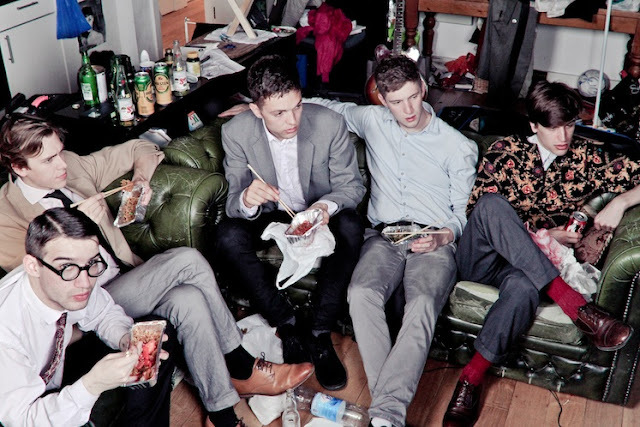 They’ve already played on Later…With Jools Holland, been nominated as BBC’s Sound of 2012 and are set to tour with Florence and The Machine; all this and they haven’t even released an album yet. Est.1987 has already caught up with captivating front-man Frederick Macpherson ahead of their headline tour. To read what Fred had to say about touring, the album and east London, head HERE. The evening’s proceedings are kicked off as solo support act David’s Lyre takes to the stage. Returning to Manchester, his “second-home”, David’s Lyre is actually Paul Dixon; one voice, one guitar. But, don’t be deceived, David’s Lyre is not just a voice or just a guitar. Songs such as “These Trees” work to effortlessly draw you in. 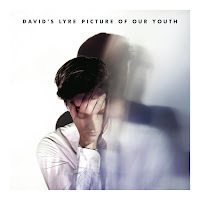 Melodic and instrumental but not in an obvious way, David’s Lyre push the boundaries of the blend between lyricism, folk and popular music. “Only Words” perfectly captures this blend; it is dark, melodic, instrumental but ultimately beguiling. David’s Lyre is one to watch; the debut album is out on Monday. David’s Lyre was the perfect introduction to Spector who take to the stage at the sold out Deaf Institute to rapturous applaud. The front of the stage is lined with girls bewitched by Fred’s every move and a huddle of men dressed up in suits and black rimmed glasses, an ode to the front-man’s trademark style.The east London quintet, suitably dressed for the occasion, open with single “What You Wanted” and it is clear that the audience tonight have got what they wanted! It may not be “Friday Night”, as the following song suggests, but the packed out room show Spector that any night can be a party night in Manchester. The band have attracted a diverse range of fans here this evening, testament to the fact that their blend of 80s style mid-synth guitar-pop has wide appeal. Fred is charismatic and oozes effortlessness up on stage, even when he does admit a slight faux pas in having to come on stage dabbing his shaving cuts with a white T-shirt; “I only had a single blade Bic razor and skimmed milk…and I’m a haemophiliac!” Between songs he pulls out a comb to realign his perfectly slicked back hair and button back up his grey suit blazer. There is much anticipation for Spector’s debut album and the audience’s thirst is quenched a little this evening as we are treated to a taste of it in the form of the upbeat and rhythmic “20 Nothing”. Fred admits that the merchandise for the tour didn’t arrive on times so the band has hand-made twenty “exclusive” T-shirts and, if anything, the cheers from the crowd confirm that they probably liked this even more! Chevy Thunder is emblazoned on the T-shirts and the crowd know what is coming as the band burst into latest single “Chevy Thunder”. The song has a vintage quality to it and it resonates through the venue as the crowd chant along, “Chevy Thunder, Chevy Chevy Thunder”. The poignant “Never Fade Away” closes the set at The Deaf Institute; no encore, no prolonged self gratification. Spector delivered pure and simple and left everyone wanting more. Spector sparkled on stage this evening, even more so than Jed’s [synth/ guitar] jumper, proving that there are exciting things in store for this east London quintet and we’ll definitely be joining everyone in the queue for the album!